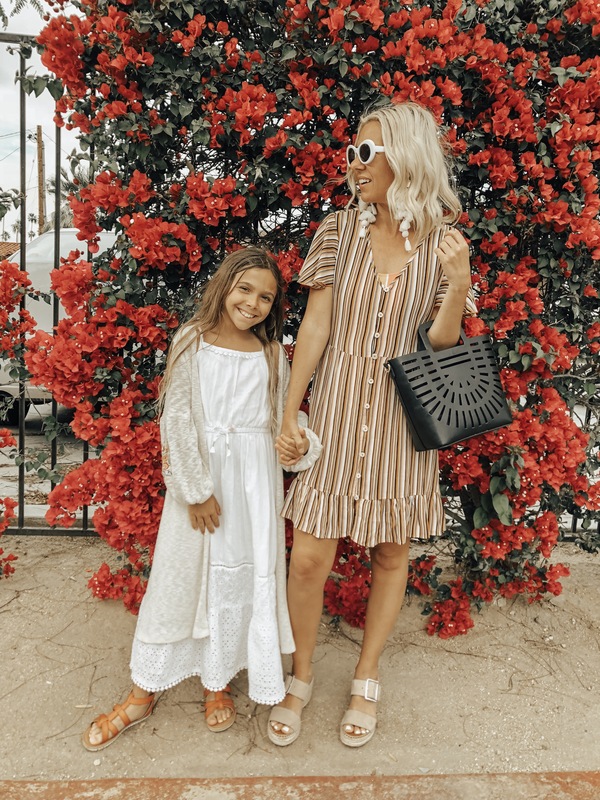 Palm Springs might be our favorite little getaway destination especially in the Spring time. With it being just over an hour away and warmer weather what's not to love? Almost every time we go we try to find a new cool boutique hotel to stay at and have an adventure. This year we stayed at the V Hotel and it did not disappoint! 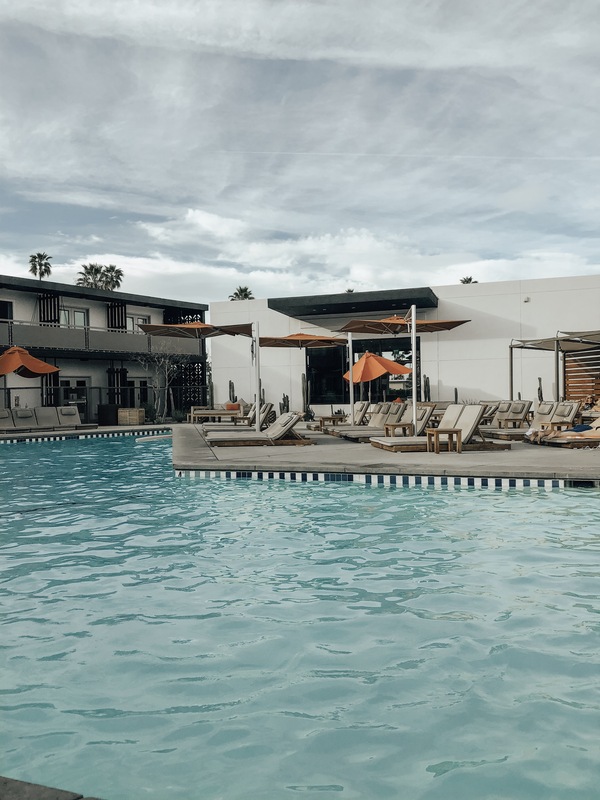 It was the cutest boutique hotel with all the retro and boho vibes that I love about Palm Springs. During the day we would lounge out by the pool with the kids doing cannon balls and playing marco polo. 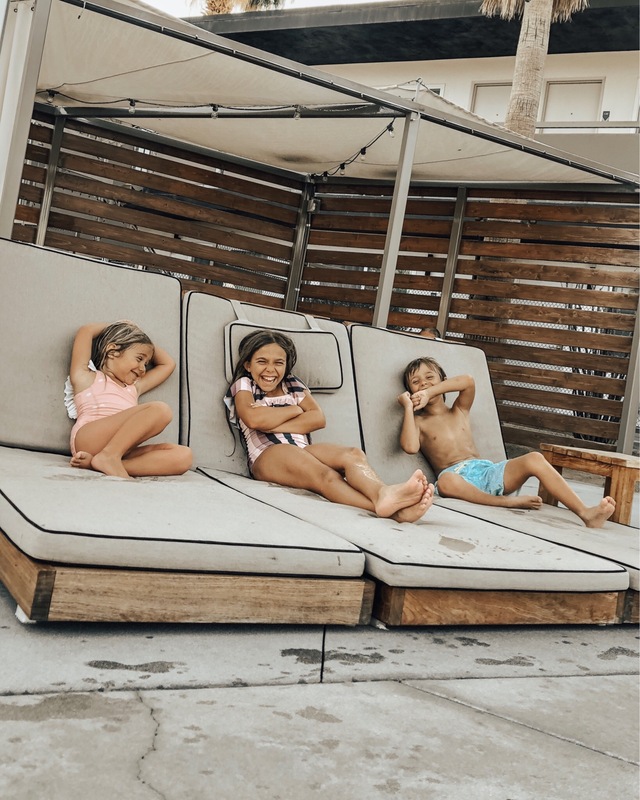 The V Hotel has tons of pool chairs and cabanas to hang out in which is definitely a necessity. They also had a fun unicorn pool float which the kids and I loved lounging on. There was even a little outdoor Jenga game set up where the kids got to play in between pool games. We even had lunch by the pool one day and the chicken club sandwich was so good! They also have tons of yummy drinks to choose from! My go-to pool stye right now is a great one piece swimsuit and a kimono. I love that I can run around and play with the kids and still be comfortable yet still stylish. And of course I can't miss an opportunity to be matching with my little Blondie. 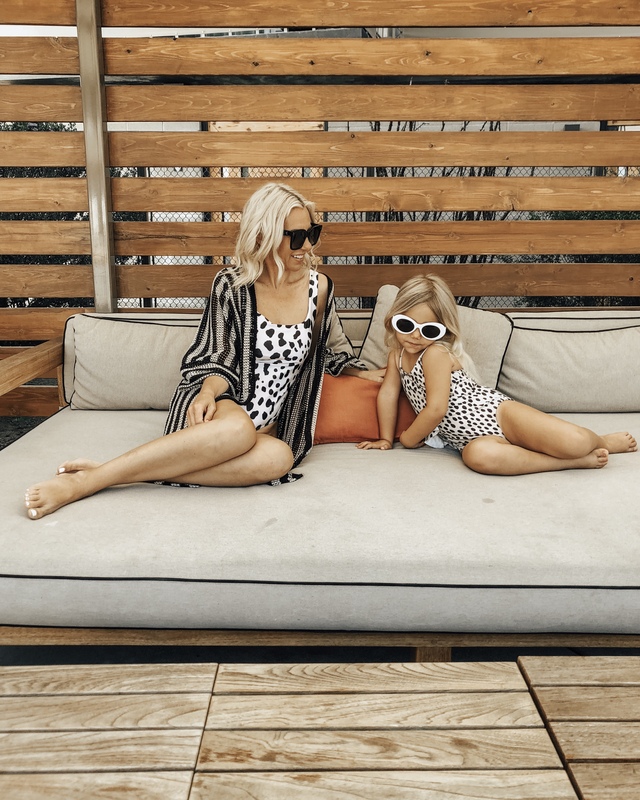 Here's a few of my favorite swimsuit and kimono styles. After spending the whole day at the pool it's fun to go downtown and walk around and find a cool restaurant to eat at. Every Thursday night in Downtown Palm Springs they have a street festival. They close down the main street and there's tons of vendors selling food and all kinds of fun things. There's even live music! We ended up having pizza and pasta at one of our favorite little restaurants next to the theater called the Kalura Trattoria. We've eaten there quite a few times over the years and it never disappoints. 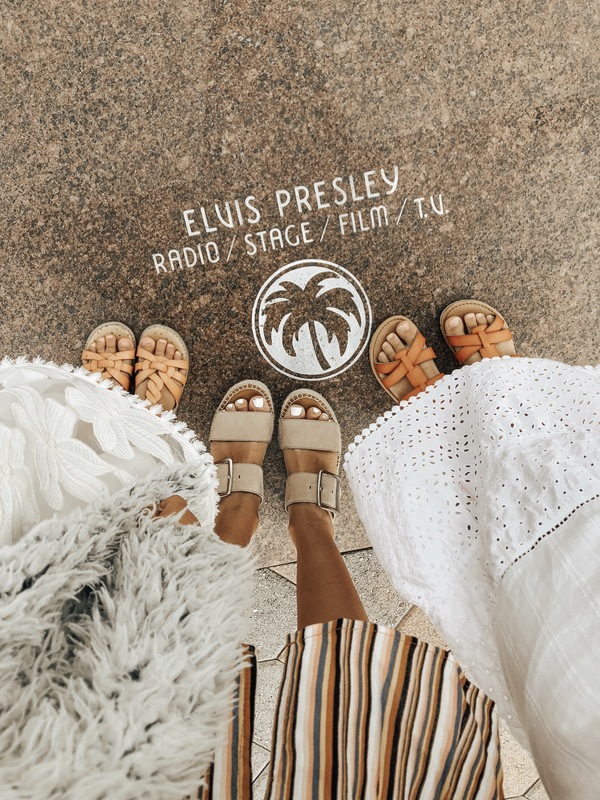 There's tons of little boutique shops to check out in downtown as well as some new chain stores that recently opened such as H&M and Free People. Of course we stopped by Ben & Jerry's and got some ice cream too! When walking around I love wearing comfortable jumpsuits, rompers or spring dresses. And I wore THESE espadrilles non stop because they're just that comfy and go with everything! Here's a few of my favorites that I wore. Eventually our little getaway had to come to an end and now we're back to school and our normal routine. 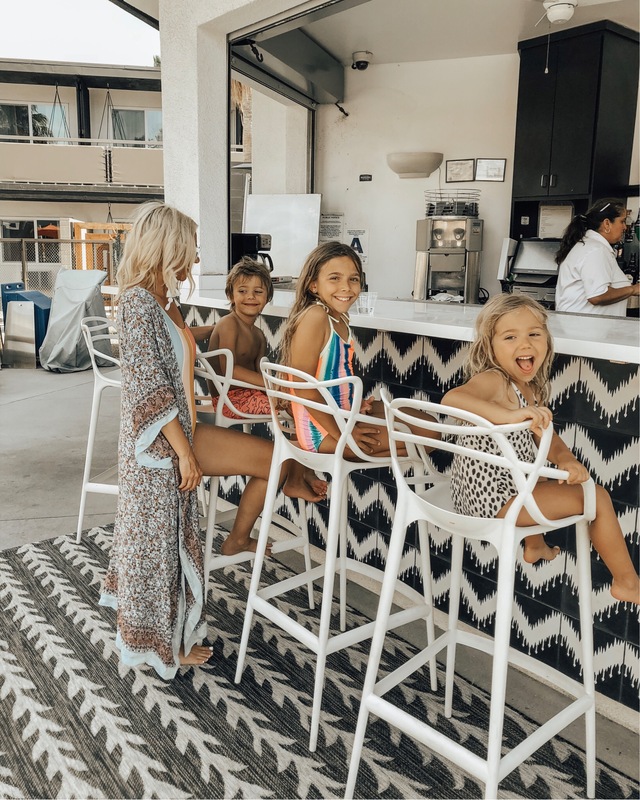 Whenever I'm feeling in a rut or the need for a little adventure we love to pack up the kids and head to Palm Springs to get some quality family time. We had such a blast and can't wait for our next adventure! Thanks for stopping by!